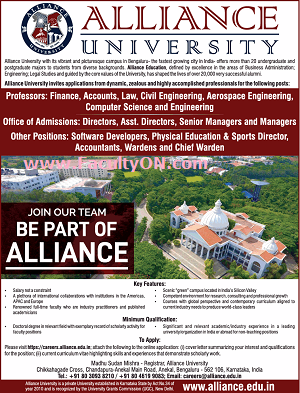 Alliance University, Bangalore has advertised for the recruitment of Professor Plus Non-Faculty jobs vacancies. Interested and eligible job aspirants are requested to apply immediately from 01st August 2018. Check out further more details below. University Profile: Alliance University is a private University established in Karnataka State by Act No. 34 of year 2010 and is recognized by the University Grants Commission (UGC), New Delhi.Alliance University is located on an extensive state-of-the-art campus on the Chandapura-Anekal main road, Bangalore. Scale of Pay: As per AICTE / UGC / University norms . How to Apply: Interested and Eligible candidates are requested to APPLY ONLINE at the official website link provided below.